Put way less of your (metaphorical) blood, sweat, and tears into treats with these must-haves. 1. A ceramic bird you can park in the middle of your double-crusted pie to release steam, and prevent unsightly bubbles and juices. Get it from Walmart for $3.21, Jet for $5.47, or Amazon for $6.27. 2. And an adjustable pie crust shield for keeping those gorgeous scallops intact and just the right shade of golden brown. FYI, it's made of BPA-free silicone! Get it from Amazon for $7.99+ (available in several styles). 3. A cake leveler so your masterpiece won't look like the leaning tower of sugar comas. Get it from Amazon for $7.66. 4. An oven rack push/pool gadget to let you *safely* take a peek and see how it's looking, smelling. Get it from Amazon for $6.54. 5. A dessert decorating tool for piping on the perfect delectable swirls with very little effort. Includes four decorating tips, a fill tip, and two couplers, and can be used with most standard Wilton tips. 6. Non-stick springform pans to help bring cheesecakes and other circular treat recipes from URL to IRL without looking like you sawed off the edge. Made with BPA- and PFOA-free coating. Get a pair from BuzzFeed's Tasty collection at Walmart for $17.74. 7. A tiered cooling rack for giving your treats the space they need to cool down before eating. Stacking cooling racks are a nightmare, tbh. 8. A cake turntable/stand to get an even icing application AND make a drool-worthy time lapse video you can share on Instagram. 9. And an icing smoother you can use with it to make everyone think you picked up your creation from that fancy bakery down the block. Get it from Walmart for $7.97 or Amazon for $9.89. And if you're feeling particularly ambitious, get a fondant smoother by the same brand from Amazon for $4, Walmart for $5.70, or Jet for $5.70. 10. A cookie scoop that'll finally help you achieve the perfectly sized mounds of dough every single time. Get it from Amazon for $13.75+ (available in six sizes). 11. A cook press set to churn out the most gorgeous treats that people won't even want to eat them. Jk. Get it from Amazon for $16.96. 12. An adjustable measuring cup built for making sure no drop of sticky ingredient goes to waste. Get it from Amazon for $11.99+ (available in 1- or 2-cup). 13. A slim, flexible spatula to wield icing (the best part, tbh) just as you please. *And* it's heat-resistant up to 500 degrees F.
Get it from Amazon for $5.50+ (available in five colors). 14. 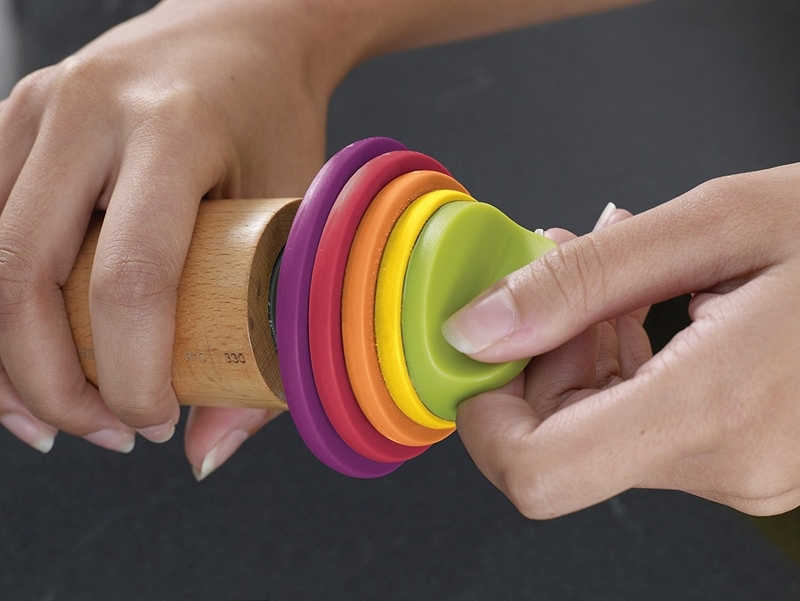 An adjustable rolling pin so you'll never have to eyeball your dough thickness again — quite the dangerous game. Includes 1/16, 1/6, 1/4, and 3/8-inch removable discs make it simple to roll to a desired thickness. Get it from Amazon for $19.95 (available in two color combos). 15. Silicone baking mats — they eliminate the need for cooking sprays, oil, parchment, and other stuff you normally use to prevent burned cookie bottoms! Heat-resistant up to 480 degrees F.
Get a pair from Amazon for $9.62+ (available in four color combos). 16. And a pastry mat with measurements because baking is a science that'll get all thrown off if you aren't precise. 17. Speaking of precision, a digital scale to let you know when your ingredients are just a smidge off. Scale switches off after two minutes of inactivity, so no need to worry if you forget to turn it off! It includes two AAA batteries. 18. A quartet of bowl and dough scrapers that'll help you make sure you get all those precious ingredients where they need to go. This model 12 settings and can whip up a 1.5 or 2 lbs. loaf. Get it from Amazon for $59.52 or check out a similar one from the same brand from Jet for $37 or Walmart for $41.99.